Buttigieg made it clear the issue isn’t that Pence is a Christian — a faith both Buttigieg and Pence share — but policies in the name of religion that have hurt LGBT people. Pence’s long anti-LGBT history includes one such initiative that allowed discrimination against LGBT people in the name of religious freedom. In 2015, Pence as Indiana governor signed a “religious freedom” bill that permitted individuals and business to refuse services to LGBT people. Under pressure from LGBT advocates and business community, Pence was forced to sign a “fix” to the law significantly limiting its scope. 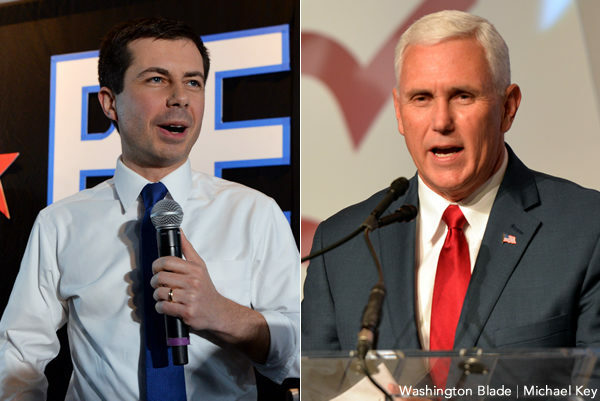 Buttigieg also had advice for Pence, saying if the vice president doesn’t want to known as anti-LGBT, he should denounce discrimination against LGBT people. Ignoring Pence’s long anti-LGBT history, the right-wing media had a field day over the comments, asserting Buttigieg was unfairly criticizing Pence. The remarks led Pence to say his Christian faith was under attack in an CNBC interview days later. After Buttigieg responded to Pence on her show, Degeneres followed up by concurring with Buttigieg’s assessment “it’s really a shame” religion is often used as an excuse to discriminate against LGBT people. “There is nothing wrong with religion and it’s really good for a lot of people and it works for a lot of people, but religion is used sometimes to justify, they say, well, it says here in the bible this,” Degeneres added. When Degeneres asked Buttigieg, an Episcopalian, how he reconciles his faith with being gay, Buttigieg cautioned his faith need not apply to everyone, but has guided him to help the most vulnerable. Ultimately, Buttigieg said not everyone need to share his religious views, but they have influenced his approach to politics. The Washington Blade has placed a request in with the vice president’s office seeking comment on Buttigieg’s call for Pence to clarify he against discrimination against LGBT people.